The OMEGA™ HHF-SD2 combination vane and standard thermistor anemometer with SD card data logger has multiple features that make it suitable to use in such applications as air conditioning and heating systems, measuring air velocities and wind temperature. What sets the HHF-SD2 apart from other vane anemometers is that it incorporates a real-time SD card data logger. 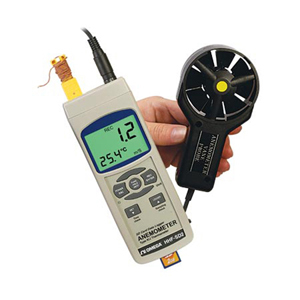 The HHF-SD2 measures velocity, and air temperature, and has an input socket that accepts a Type J or K thermocouple that can be used as a highly accurate thermometer. The vane and standard thermistors provide high accurate readings at high velocities. The HHF-SD2 is innovative and easy to operate. Download data from the SD card into an Excel spreadsheet without the need for special software. 참고: Comes complete with vane probe, hard carrying case, 2 GB SD card, Type K thermocouple, 6 “AAA” batteries and operator’s manual.